Water Bureau employees are opening their hearts and their wallets this holiday season to help make the season brighter for local children in need. 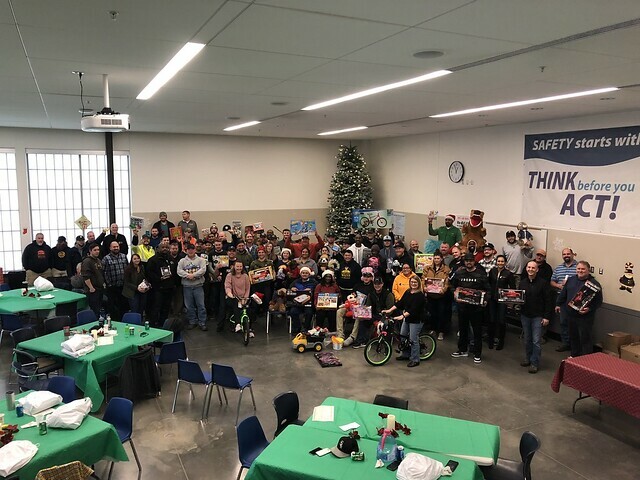 This December, Portland Water Bureau employees joined together and filled 50 bags full of new, unwrapped toys and five bicycles to be donated to the Portland Fire and Rescue's Toy & Joy Makers program. In total, bureau employees donated $3,336! Angie, Administrative Specialist in the Maintenance and Construction division, coordinated the Water Bureau’s participation in the toy drive, ensuring all toys are delivered to Portland Fire & Rescue for distribution in the local community. The holidays aren’t the only time Water Bureau employees help out. Many volunteer with local organizations, donate to food banks and shelters, and raise money for various charities. Interested in making a donation before the New Year? Learn more about Toy & Joy Makers to find out how you can help.